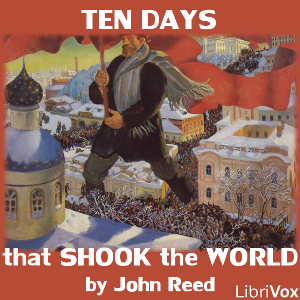 Ten Days that Shook the World (1919) is a book by American journalist and socialist John Reed about the October Revolution in Russia in 1917 which Reed experienced firsthand. Reed followed many of the prominent Bolshevik leaders, especially Grigory Zinoviev and Karl Radek, closely during his time in Russia. John Reed died in 1920, shortly after the book was finished, and he is one of the few Americans buried at the Kremlin Wall Necropolis in Moscow, a site normally reserved only for the most prominent Soviet leaders. "...he wrote Ten Days that Shook the World - wrote it in another ten days and ten nights or little more. He was gaunt, unshaven, greasy-skinned, a stark sleepless half-crazy look on his slightly potato-like face - had come down after a night's work for a cup of coffee. Play 04 04 - On the Eve, Part 2 Sharon C.